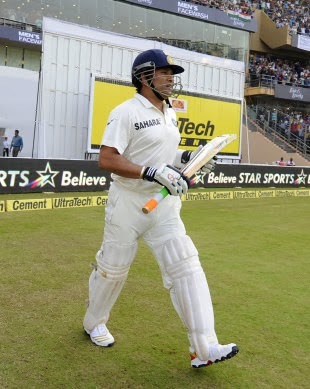 Sachin Tendulkar will become the first sportsperson to be conferred the Bharat Ratna, India's highest civilian award. The Prime Minister's Office made the announcement hours after Tendulkar brought down the curtains on a 24-year international career. "Sachin Tendulkar is undoubtedly an outstanding cricketer - a living legend who has inspired millions across the globe," a PMO release said. "During the last 24 years, since the young age of 16 years, Tendulkar has played cricket across the world and won laurels for our country. He has been a true ambassador of India in the world of sports. His achievements in cricket are unparalleled, the records set by him unmatched, and the spirit of sportsmanship displayed by him exemplary. That he has been honoured with several awards is testimony to his extraordinary brilliance as a sportsman." Speculation about Tendulkar getting the award has been around for years, and peaked in 2011 when the eligibility criteria for the award was broadened. Originally, the honour was for excellence in "art, literature, science and public services" but was amended to recognise "performance of highest order in any field of human endeavour". In 2008, Tendulkar became the first sportsperson, along with chess grandmaster Viswanathan Anand, to receive the Padma Vibhushan, India's second-highest civilian honour. Tendulkar received the Arjuna Award (a national award for distinguished sports persons) in 1994, and in 1998 he received the Rajiv Gandhi Khel Ratna award, the country's highest sporting honour. The next year, he was the recipient of the Padma Shri ( the fourth-highest civilian award). Previous recipients of the Bharat Ratna include Nobel laureates Nelson Mandela and Mother Teresa.